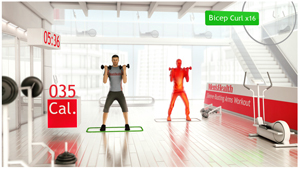 Ubisoft and Rodale Inc., publisher of Men’s Health and Women’s Health magazines, have solidified a partnership to create workouts specifically tailored to men’s and women’s individual fitness goals and needs for the new video game, Your Shape: Fitness Evolved. Available exclusively on Microsoft’s Xbox 360® video game and entertainment system, the game will launch alongside Microsoft Kinect™ for Xbox 360® in November, 2010. This entry was posted on Tuesday, September 14th, 2010 at 8:28 am and is filed under Business News, Everyone, National News, Simulations, Sports, Upcoming Releases. You can follow any responses to this entry through the RSS 2.0 feed. You can leave a response, or trackback from your own site.